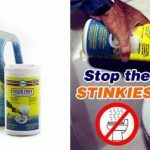 Why is your Alumabrite better than other products? I recently purchased a 22 ft Crest pontoon boat that only came out of the lake for it’s annual maintenance. The pontoon’s had some light algae, which I pressured cleaned, Now to find a product that is easy to use and will remove the oxidation, waterline scum, etc. I have researched other products, most seem to have an acid that turns the toons white. I’m looking for a product that will clean and hopefully make the toons have a clean and shiny appearance. I’m not sure if I will polish them out to a new, almost mirror shine, lots of work!, Please tell me why your AlumaBrite is better than other products. How much would I need for my 22ft’ boat? Where can I buy in the states? I’m in Sarasota, Florida. Congratulation on your new boat. I’ve visited their factory and can tell you that Crest makes a great boat. 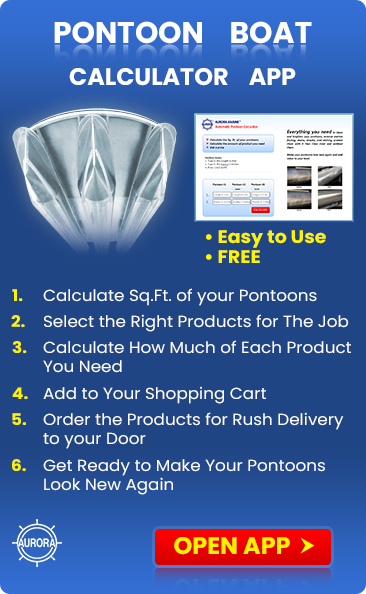 Many pontoon cleaners and brighteners are actually industrial cleaners that are repackaged for the marine industry and the results of using these products can be less than favorable. Streaks, splotches and a white color on a bridge or tank may not be important but will make your pontoon boat look terrible. Based on what you’re telling me, you need to start with Algex to get the remaining marine growth and waterline stains off the pontoons. Next you can buff them with Alumabuff to remove the stains, streaks and restore the shine. 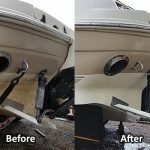 You can buff out a pontoon with Alumabuff in less than 60 minutes, without destroying the Mill Finish. You can then protect the pontoons with Alumetron. 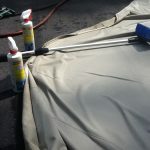 It will keep them shiny and easy to keep clean and it comes with a 5 Year Warranty. 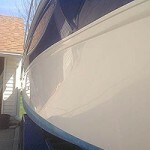 You can then protect the bottoms against fouling with VS721 clear bottom coat. VS721 will also improve the boat’s performance and reduce fuel consumption. I would think twice about buffing them to a chrome finish. The process is very time consuming, difficult, dirty and expensive. If you do it right, they look good, but the maintenance on them really goes up. Because you strip away the protective aluminum oxide, you need to continue to keep atmospheric oxygen from degrading the finish. You can’t use a clear coat to protect the finish without making them milky. You need to keep a good coat of wax on them, which means re-waxing about once a month. Are you up for that or do you want to go boating? If you let them go, then it’s start all over again. Each time you grind off another couple of layers of aluminum. Our Alumabrite is a marine grade brightener that you can use after Algex, if you don’t want to buff. When used as directed, it will give you a silvery finish instead of white. It’s quick and easy to use, but it does have its limitations. 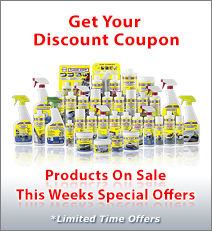 It won’t remove streaks and white etching from acid cleaners the way that Alumabuff will.